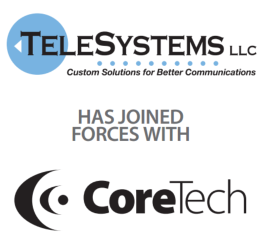 We are pleased to announce that TeleSystems, LLC has joined forces with CoreTech! Better together. With voice communications and information technology merging in the marketplace, the time is right for our teams to combine expertise and offer additional services to our clients. All this knowledge under one roof means your business may contact one place for all your technology needs. Whether it be phone systems, voice communications, cloud, unified communications, or additional IT support, IT security, data backup, and technology consulting—contact us. Dedicated to serving you. The TeleSystems team will continue to offer the same high-quality service you have come to expect. In addition, you will have the opportunity to choose from new service options in the near future (join our email list). Your team. The TeleSystems staff who have served your business in the past will continue to be here to assist and consult with you. Mike, Dean, Jim, Sue, Barb, Jason, Rick, and Bob will be joining the CoreTech team at their location: 9711 M Street, Omaha, beginning June 28, 2017. Contact us. We would love to hear from you at our new place. ONE CALL. ONE TEAM. COLLABORATION. Our passion is serving your Omaha or Lincoln-area business. Our experts enjoy delivering integrated technology management and solutions which keep your business humming. We are committed to earning your business through constant, enthusiastic effort each day. Contact us today and let's meet about how we can help your small to midsize business.